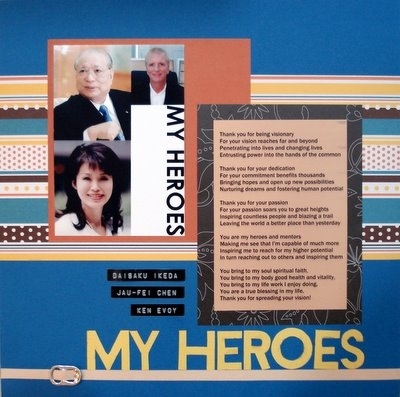 This scrapbooking idea is about scrapbooking people who exert an influence in your life – your heroes. Well, you can choose to focus all your attention on your single biggest hero. Or you can choose to scrapbook about your top 10 favorite heroes. The heroes you choose to scrapbook about will let others know how these characters have shaped you in certain ways. You can write about the reasons why these personalities knowingly or unknowingly, directly or indirectly play an influential role in your life. You can turn your page into a tribute to your heroes. You can also talk about the lessons you’ve absorbed from them. For me, as I think about my larger than life heroes, three very diverse personalities came to mind. They are of heroic proportions to me and impact me in different areas of my life. One is a highly inspiring spiritual leader whose wise guidance through his writings, videos, news, activities continue to awe and move me deeply, inspiring me to draw out my innate potential. Another is a brilliant nutritional immunologist with a vision for a disease-free world and bringing good health to others through her well-researched range of health food, skincare and cosmetics. Thank you for spreading your vision! Okay, time for you to think about your heroes and the kind of influence they have on you and your life. Enjoy this scrapbooking idea! Supplies used: Cardstocks – Bazzill Basics; Orange paper – Grant Archival “Scrapbook Paper Pack”; Striped patterned papers – Pebbles Inc “Mahattan”; Black and white patterned paper – SEI “Black Orchid”; Tag labeler and black labels; Buckle – from stash; Photos – sourced from the Internet; Title font – Century Gothic; Text font – Franklin Gothic Medium. I was totally surprised to see President Ikeda of SGI on here. I was wondering about your background and this gave me more info. Thank you for inspiring me to put my memorable trip with my daughters into an album.